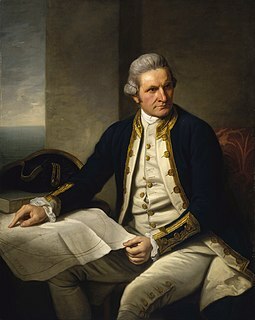 Painting by William Parry made after Captain Cook's second voyage (c. 1775–1776). This depicts Omai, a Tahitian, Sir Joseph Banks and Daniel Solander (seated). Solander was born in Piteå, Norrbotten, Sweden, to Rev. Carl Solander a Lutheran principal, and Magdalena née Bostadia. Solander enrolled at Uppsala University in July 1750 and initially studied languages, the humanities and law. The professor of botany was the celebrated Carl Linnaeus who was soon impressed by young Solander's ability and accordingly persuaded his father to let him study natural history. Solander traveled to England in June 1760 to promote the new Linnean system of classification. In February 1763, he began cataloguing the natural history collections of the British Museum, and was elected a Fellow of the Royal Society in June the following year. 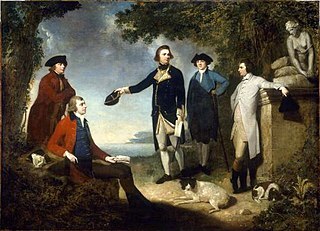 In 1768, Solander gained leave of absence from the British Museum and with his assistant Herman Spöring accompanied Joseph Banks on James Cook's first voyage to the Pacific Ocean aboard the Endeavour. They were the botanists who inspired the name Botanist Bay (which later became Botany Bay) for the first landing place of Cook's expedition in Australia. Solander helped make and describe an important collection of Australian plants while the Endeavour was beached at the site of present-day Cooktown for nearly seven weeks, after being damaged on the Great Barrier Reef. These collections later formed the basis of Banks' Florilegium. Solander also wrote a manuscript describing all the species collected from New Zealand during the six months the 1768 expedition spent there. It was called Primitiae Florae Novae Zelandiae ('beginnings of a New Zealand flora'), and was to be illustrated with the plates prepared by Banks. It was never published, but it was available for study by anyone interested, first at Banks' London home, then at the Natural History section of the British Museum. Solander's return to Britain with Cook and Banks made him the first Swede to circle the globe. On their return in 1771 Solander resumed his duties at the British Museum but also collaborated with Banks on the Florilegium. In 1772 he accompanied Banks on his voyage to Iceland, the Hebrides and the Orkney Islands. Between 1773 and 1782 he was Keeper of the Natural History Department of the British Museum. In 1773 he was elected a foreign member of the Royal Swedish Academy of Sciences. Solander died at Banks' home in Soho Square of a stroke, aged 49, on 13 May 1782. An autopsy was performed the next day, and revealed a brain haemorrhage. He is buried in the Swedish Section at Brookwood Cemetery. Solander's reputation has been profoundly influenced by his limited number of publications and his premature death. Although he had detailed descriptions prepared for most of the botanical specimens he collected on the Endeavour voyage, in deference to Joseph Banks he held off publication waiting for the completion of over 700 engravings. However, after Solander's death, Banks, now President of the Royal Society, failed to publish his projected Florilegium. Had he done so, he would have secured Solander's posthumous reputation. It has been claimed that Banks treated Solander, and Jonas Dryander, as his servants rather than as botanists of equal standing to others in the botanical establishment. However, Banks clearly had a strong emotional bond with Solander, met his expenses and even supported his relatives in Sweden. In 1784, when he wrote to Johan Alströmer of Solander's death, Banks declared: 'This too early loss of a friend, whom I during my more mature years have loved and whom I will always miss, makes me wish to draw a veil over his death, as soon as I have ceased to speak of it. I can never think of it without feeling a mortal pain.' Solander remained an employee of the British Museum for the last decade of his life but was also paid by Banks to assist him with his collections. Banks' relationship with Robert Brown was more formal. Solander invented the book-form box known as the Solander box which is still used in libraries and archives as the most suitable way of storing prints, drawings, herbarium materials and some manuscripts. Solander Gardens in the east end of London is named after him, as are the Solander Islands off New Zealand's South Island and Cape Solander in the Kamay Botany Bay National Park. Also Solander Island, off the NW coast of Vancouver Island, Canada. One of the many plants named in his honour is Fuscospora solandri (black beech). Solander was associated with Banks in Illustrations of the Botany of Captain Cook's Voyage Round the World, and his The Natural History of Many Curious and Uncommon Zoophytes, Collected by the late John Ellis, (1786) was published posthumously. The 'Daniel Solander Library' in Sydney's Royal Botanic Garden, established in 1852, is the oldest botanical research library in Australia. In Solander's birth town Piteå the Solander Science Park houses a number of cleantech companies and research organizations. The standard author abbreviation Sol. is used to indicate this person as the author when citing a botanical name. ^ a b c Gilbert, L. A. (1967). "Solander, Daniel (1733 - 1782)". Australian Dictionary of Biography. 2. Canberra: Australian National University. Retrieved 25 February 2010. ^ "Fellow Details". The Royal Society. 2019. Retrieved 23 January 2019. ^ "Primitiae Florae Novae Zelandiae [First Fruits of the Flora of New Zealand]". Celebrating Botany (1924-2014). University of Otago. Retrieved 10 July 2015. ^ "Topic: Banks' Florilegium". Museum of New Zealand: Te Papa Tongarewa. Museum of New Zealand. Retrieved 10 July 2015. ^ Chambers, Neil (ed.). The Letters of Sir Joseph Banks: A Selection, 1768-1820. London: Imperial College Press. p. 81. ISBN 1860942040. ^ Barker, R. M.; Barker, W. R. (1990). "Botanical contributions overlooked: the role and recognition of collectors, horticulturists, explorers and others in the early documentation of the Australian flora". In Short, P. S. (ed.). History of systematic botany in Australia. Australian Systematic Botany Society. pp. 37–86. ISBN 0-7316-8463-X. ^ "Daniel Solander Library". Royal Botanic Garden, Sydney. Retrieved 10 October 2016. Marshall, John Braybrooke. "Daniel Carl Solander, Friend, Librarian and Assistant to Sir Joseph Banks." Archives of Natural History 11.3 (1984): 451-456. Serle, Percival (1949). "Solander, Daniel Charles". Dictionary of Australian Biography. Sydney: Angus and Robertson. "Solander, Daniel Charles" . Dictionary of National Biography. London: Smith, Elder & Co. 1885–1900. Jacques-Julien Houtou de Labillardière was a French biologist noted for his descriptions of the flora of Australia. Labillardière was a member of a voyage in search of the La Pérouse expedition. He published a popular account of his journey and produced the first Flora on the region. Chrysolopus spectabilis is a species of weevil found in south-eastern Australia. It was discovered during James Cook's first voyage, and became the first insect to be described from Australia. The weevil measures up to 25 mm (1.0 in) long and includes distinctive metallic green and black scales. It is found only on 28 species of the plant genus Acacia. A Solander box, or clamshell case, is a book-form case used for storing manuscripts, maps, prints, documents, old and precious books, etc. It is commonly used in archives, print rooms and libraries. It is named after the Swedish botanist Daniel Solander (1733–1782), who is credited with its construction while working at the British Museum, where he catalogued the natural history collection between 1763 and 1782. Edward Duyker is an Australian historian, biographer and author born in Melbourne. Ripogonum scandens, is a common rainforest vine native to New Zealand. It can also grow in areas of swamp.